The drive wheel on a power wheelchair is the larger wheel if you are looking at your wheelchair or client’s wheelchair. The location of this drive wheel can have a large impact on how the power wheelchair drives and maneuvers in different environments. 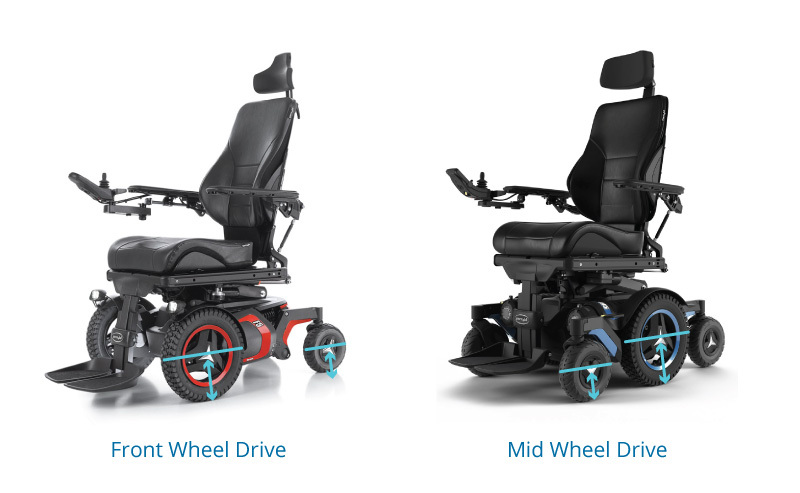 There are three main types of drive wheel configurations on power wheelchairs: front-wheel drive, mid-wheel drive, and rear-wheel drive. In this blog today, we will focus on front-wheel drive. The front-wheel drive power wheelchair is typically going to be good for maneuverability indoors and optimal for outdoor use. This is because of the larger drive wheel being the first wheel to overcome the uneven terrain versus the smaller casters. Because the front wheels are connected to the drive motors, these pull the casters over obstacles and through various terrains versus if the casters were the front wheel. In the case of the casters being in front, the casters are being pushed, the force generated is forward and downward. This would be similar to a plowing effect and can increase the likelihood of becoming stuck in certain situations. Another factor to consider when navigating obstacles is the distance from the axle (center of the wheel or caster) to the ground. Any obstacle larger than that distance is what we call a “hard stop”. The chair will not go over an obstacle that is larger than that distance. So, when you are driving forward over an obstacle there is obviously a big advantage to front-wheel drive just in the physics of the wheel being larger. The drive wheel overall diameter on a front-wheel drive is 14”, and the caster wheel on a mid-wheel power wheelchair is 7”. So, the obstacle you can possibly climb in a mid-wheel drive power wheelchair is literally cut in half. 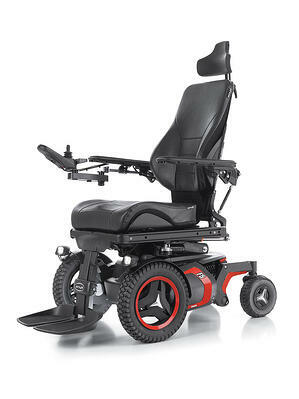 For individuals looking to go over all terrains, the front-wheel drive wheelchair may offer the best solution. Another benefit of front-wheel drive is the smoothness of the ride. Look at how many wheels are on the ground. In the case of front-wheel drive there are four wheels versus the six wheels with a mid-wheel drive chair. This means that as the end-user goes over a bump in a front-wheel drive chair, they would feel the force of that bump two times versus three in a mid-wheel drive. This can also be important for individuals who may easily lose their positioning when going over any uneven terrain. We could talk about front-wheel for hours, but the final benefit to mention is the front-wheel drive chair’s smallest front turning aspect. In all the configuration options, the chair will turn on its drive wheel. The photo below shows an example of a bathroom. In this bathroom the sink is positioned against the wall. Because the wheelchair turns on its drive wheel and the end-user can only pull themselves so close to the wall before turning, we can see the only chair to gain full access to the sink is the front-wheel drive. 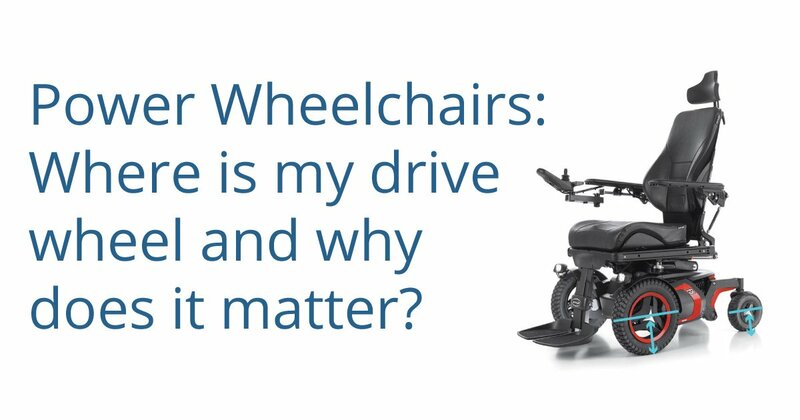 Does this mean that everyone should have a front-wheel drive wheelchair? No, but it does mean that it is important for clinicians, suppliers, and clients (end-users) to consider the environment that the client lives in. Often, I hear that people stay clear of front-wheel drive because it doesn’t have as small of a turning radius as mid-wheel drive and it is harder to learn to drive. Both of those statements are true. The front-wheel drive will have a slightly larger 360 degree turning radius, but as you saw above it has the smaller front turning aspect which may be utilized more than someone turning in a full circle. Most of the turns a client must negotiate in a power wheelchair are 90 degrees in nature. For example, driving straight and then veering or turning to the right and left, therefore the reduced front turning aspect, can be a real benefit. Needing to spin in one place (180 degrees) for example, when entering and exiting a small or crowded elevator, might be less important for your client as those types of turns are far less common. Hug the corner: When going through a doorway the end-user will want to “hug” the corner or keep a tight turn. Turn towards the problem: For example, when positioned adjacent to a wall/barrier, turn toward the wall/barrier, then slightly reverse to allow the rear casters clearance for turning in the desired direction. This might sound complicated, but if you remember to turn into the problem you will easily maneuver away from the problem. Keep in mind that not everyone will benefit from the same drive wheel configuration and it is important to ask the questions and complete an evaluation to determine which drive wheel would be best for you or your client. Rachel Fabiniak began her studies at The Georgia Institute of Technology, where she graduated with her Bachelor of Science in Biology in 2009. Rachel then went on to receive her Doctorate in Physical Therapy from Emory University in 2013. 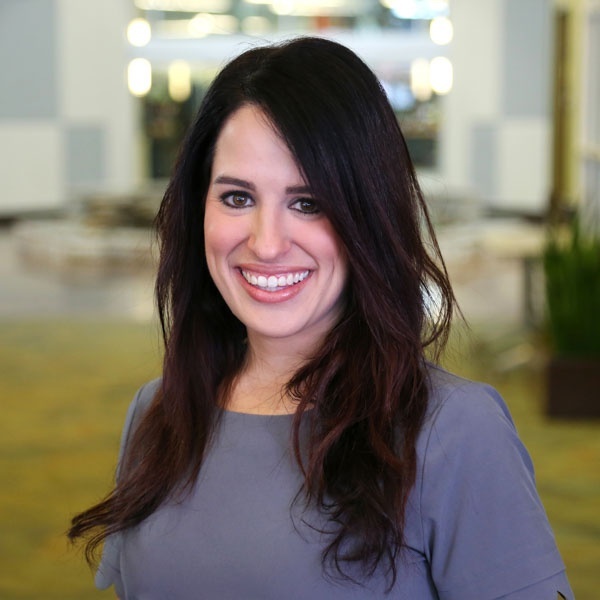 After receiving her doctorate, Rachel went into clinical practice as a physiotherapist in the Spinal Cord Injury Day Program at Shepherd Center in Atlanta, Ga. Rachel also has experience in community physiotherapy and inpatient rehabilitation. During Rachel’s time at Shepherd Center, she developed a passion for seating and mobility which ultimately lead to her career with Permobil. Rachel joined on with Permobil in January 2018 and relocated to Sydney, Australia in June 2018 as the clinical education specialist for Australia and New Zealand.